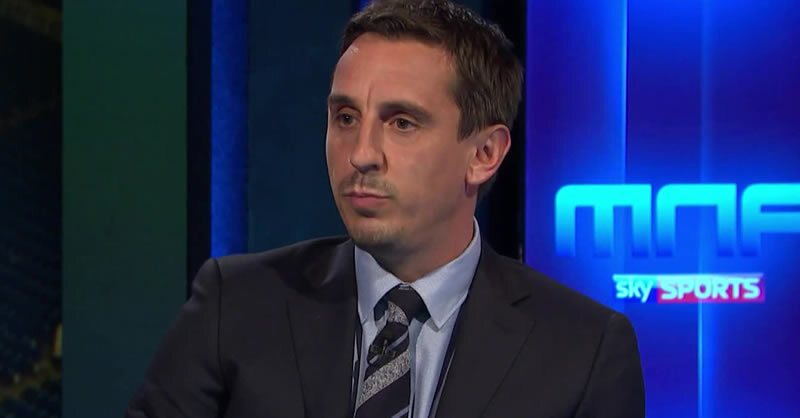 Gary Neville has criticised Chris Smalling’s failure to communicate that the Manchester United defender was struggling in the leading up to Leicester City’s equaliser in a 2-2 draw at King Power Stadium. The Red Devils were looking to reduce Manchester United’s lead at the top of the Premier League table to 13 points following a 2-1 loss to Pep Guardiola’s side at Old Trafford earlier in December. Manchester United fell behind the first half at Leicester following Jamie Vardy’s 50th Premier League goal before Spanish midfielder Mata levelled with five minutes to in the first half. The 29-year-old edged Manchester United into a 2-1 lead with a brilliant goal to leave the Red Devils on the cusp of three points. However, Smalling struggled with a fitness problem in the closing moments of the game, eventually going off the pitch before he returned to the Manchester United team for the final minutes of the Premier League clash. And the England international was caught out for Leicester’s equaliser after Marc Albrighton’s cross found Harry Maguire and the centre-half guided a finish past David De Gea. Former Manchester United defender Neville questioned Smalling’s role in Leicester’s late equaliser at the King Power Stadium. “Smalling has got to flag up as an experienced defender that he’s struggling, get someone else into the centre,” Neville told Sky Sports.